So what happened to the Mercedes cars? Overheating caused a high voltage surge through the Control Electronics unit (CE), terminating the link between the battery and the MGU-K and thus reducing power by a full 160bhp. The CE is responsible for converting the Alternating Current produced in the MGU-K when harvesting into Direct Current for the battery via a series of capacitors. The same applies for the reverse process when DC is transformed into AC in three phases for acceleration. It appears that Mercedes have an independent CE for the MGU-H that runs off the turbocharger, as this continued to function as normal which undoubtedly aided Nico Rosberg’s podium survival. Lewis Hamilton, on the other hand, was unlucky but only thanks to his lacklustre qualifying lap. His car was already overheating slightly sitting in Rosberg’s gearbox and when the two drivers came to pit, the car was stationary for long enough to cook the system, hence why their failures occurred at pretty much the same time. Hamilton was running more rear brake bias at the time and was encouraged to do so by his engineer to offset the braking power from the MGU-K, but after a second pitstop they had also given up and he subsequently retired. Rosberg meanwhile opted to run more forward brake bias to protect the rear brakes and scraped home to second. Given the circumstances, though, it shows just how much Mercedes have in hand when they can still stay ahead of a Force India – albeit on very used tyres – with the same engine in the back. Ferrari came to Canada with high hopes and whilst initial practice pace looked positive, the high temperatures forced the team to abandon most of their aerodynamic modifications. Joining the Red Bull/Mercedes bandwagon, Ferrari extended the sidepods to exit above the diffuser, with cutouts for the suspension members to pass through to their respective mounting points. This allowed them to run a more aggressive central outlet around the exhaust pipe which in turn produced a new shark-fin engine cover layout. These changes are designed to remove the hot, slow travelling air passing out of the car into a more efficient area. Before the hot air was ejected right into the path of the rear suspension and Coke-bottle region. Now this has been moved to above the diffuser where the low pressure formed behind can draw it out whilst not disturbing the critical aforementioned areas of the car. This is good aerodynamically and for cooling as hot air is drawn out at a faster rate. Unfortunately for the team it probably wasn’t quite as reliable as anticipated so it was ditched for the race. 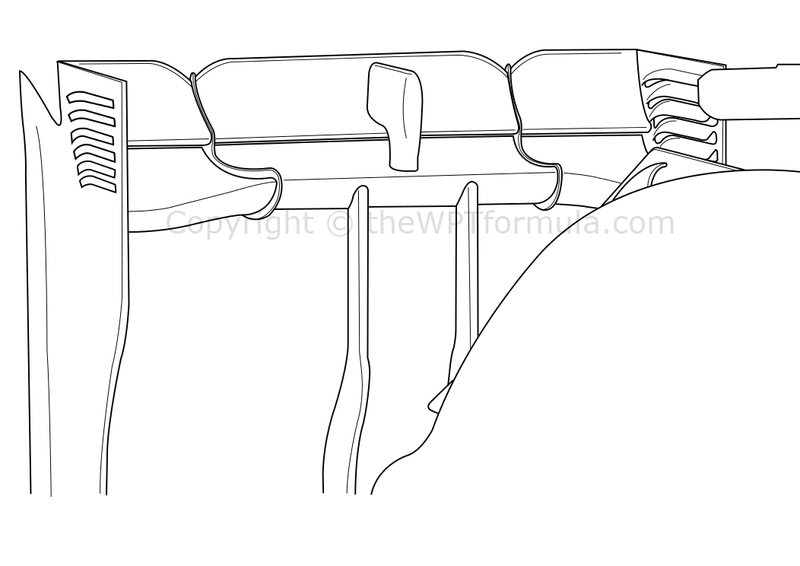 In addition, the vertical turning vanes that flank each sidepod received detail changes to the ridge over the shoulder of the sidepod and tweaks to the floor around the splitter. A low drag rear wing was also present but was not seen after Friday. Another dismal weekend for McLaren who surprisingly underperformed (in my opinion). The MP4-29 is front tyre limited in that it simply can’t warm them up properly as it lacks front downforce in comparison to the rear. I discussed this issue on Richland F1 in the build up to the weekend and this is why their qualifying pace in particular surprised me. Considering that they also have a Mercedes engine, I wonder if the team have just lost their way a bit. Hopefully the upgrades in Austria will turn their fortune around. Jenson Button ran without the ‘mushroom’ rear suspension fairings on the upper wishbone on Friday to reduce drag but later opted to use them for qualifying/race. All Renault powered teams were forced to take drastic measures to improve top speed and Red Bull were no exception. 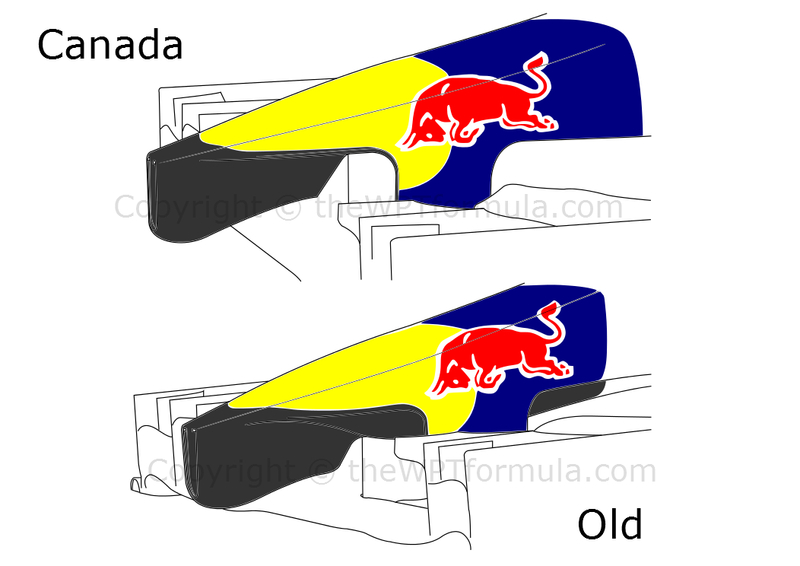 In addition to their new low downforce rear wing and complimentary endplates, the team removed the bulge from beneath the nose to decrease drag. 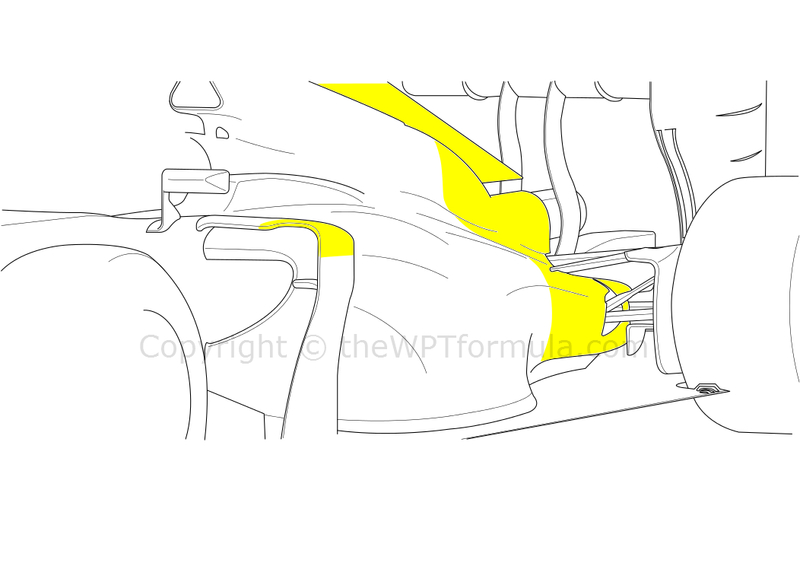 The bulge does two things: direct airflow to more desirable areas of the splitter and leading edge of the sidepod, and generate a low pressure area of its own right beneath the nose to pull the front end downwards. Deleting the bulge won’t have compromised them excessively in cornering as the corner speeds are fairly low in Canada. The Monkey Seat winglet introduced in Monaco was also swiped from above the exhaust to cut drag and new fins appeared on the front wing, similar to those seen on the Mercedes. The C33 was poorly suited to the circuit last weekend and both Sauber drivers were struggling to get the car stopped and go again in a straight line. Their brake-by-wire system has been a nightmare even before the season started and the confidence and feel just doesn’t look to be there at the moment. The aerodynamic parts, however, continue to flood out of Hinwil. The “compromise” rear wing (as I like to call it) was used to good effect and will probably feature again later in the season at circuits such as Spa and Monza. The neutral section in the middle is much shallower than the outboard regions, reducing drag whilst maintaining slightly more downforce closer to the rear tyres. This version goes against their previous low downforce configuration rear wing which featured a distinctive “spoon” shape. 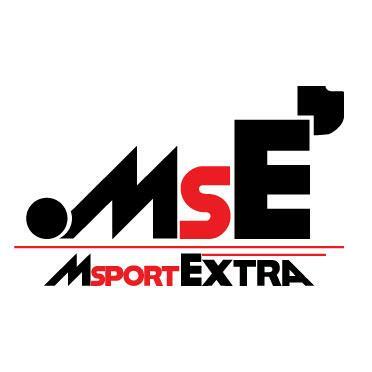 This entry was posted in 2014 Highlights, Technical Highlights and tagged analysis, canada, ferrari, floor, gp, mercedes, problems, tech, updates on June 13, 2014 by thewptformula. Cheers for explanation about Mercedes. Do you think the problem will recur? They haven’t suffered the same at any other circuit so far, and Canada is pretty tough on brakes. I doubt it, although places like Singapore are possibilities. What’s interesting is that Mercedes ran large brake duct outlets during the post-Barcelona test which didn’t appear in Canada, so they must’ve thought they’d be fine on brakes. However the main issue is the overheating of the CE rather than the brakes, and that can be addressed.